I spoke with Sarah Minor about text/visual collaboration and The Silent History at Essay Daily. I wrote about my sister and how, in writing The Silent History, I came to understand her profound impact on my family, in Buzzfeed. Back in 2002, my wife Mary-Kim Arnold and I developed this routine where we’d perform in matching orange jumpsuits and zip audience members into an orange canvas sack, rolling them across the stage until they told the truth. 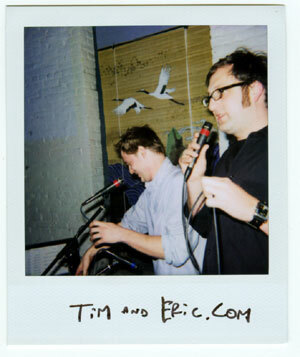 At one of these performances at the now defunct Sound Gun Recording Studio in Philadelphia, we shared a bill with these guys Tim Heidecker and Eric Wareheim, who performed as timanderic.com, and who dominated the evening with their premiere of an incredible short film they’d made about a cat film festival. It was weirder and funnier than anything I’d seen in a very long time, and Tim and Eric were recklessly oblique on stage, working on a thing that wasn’t stand-up or performance art but something way out on the frontier, like if Matthew Barney had worked at QVC instead of making the Cremaster Cycle. I’m relieved I wasn’t wearing socks that night, because they would’ve been knocked clean off my feet. My wife and I performed with Tim and Eric a few more times, culminating in a show at the Knitting Factory where I met the guy who would eventually edit Super Flat Times for Little, Brown. When I found out the book was going to be published, I asked Tim and Eric if they’d do some ‘Director’s Commentary’-style audio for scenes I’d cut out of Super Flat Times. Coincidentally, they were in need of a top-notch web designer who could update their site for the 2000s, adding in all of the slick technologies of the era that were making the Internet quite literally blow up. So we agreed on a trade: I would give their site a major facelift, making it feel like a real cutting-edge chill-out zone for anyone from the ages of 8 to 80 interested in comedy and good times, and they would record the commentary tracks for Super Flat Times. So what happened next? Well, shortly after this collaboration, Tim and Eric exploded into huge international superstars with movie deals, branded merchandise, silks, custom-made weapons, and more. And Super Flat Times, meanwhile, went on to regional acclaim, garnering several positive Amazon reviews and constructive feedback from local critics. Did I have a hand in Tim and Eric’s fame? That’s not for me to say. But do take a look at the numbers. You may find that they speak for themselves. Did I sacrifice my own fame in order to launch their careers? I can't think of any other way to slice the pie.